“Article of the Future”: New direction for scientific publishing? Prediction in some circles is that scientific publishing will become more interactive in the future and will take full advantage of the web’s interactive capabilities. Elsevier and Cell Press have launched “Article of the Future,” a collaborative project with scientists, to explore the potential of this publishing model. It looks like it could be an exciting development, with integrated audio and video being one of the most intriguing to me. 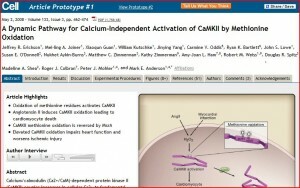 Take a look at two prototypeshttp://beta.cell.com/ posted by Cell Press. The abstract and introduction tabs in these online articles produce a look that’s familiar – pretty much what we see in print and PDF formats, other than the author interview audio link. Clicking on the results tab, however, yields something impossible with these static media. Here, we have a subset of tabs along with hyperlinked diagram(s) that drill the reader down into the paper to the point where discussion occurs. There is also a tab that brings up additional figures and another that takes the reader to the references cited in the results section. While the figures in Prototype #1 were easily viewed, I found those in Prototype #2 to have less clarity. Prototype #2 relies more heavily on photographic figures. It may be my laptop screen, but I found the “high quality” images a bit fuzzy. This may be a limitation for researchers if they don’t have high resolution monitors (and many researchers I know don’t). They may miss the high quality photographs in the print scientific journals. I also found them slow to load despite having a high speed connection. The references tab provides links for each reference – View at Publisher [if applicable], View at PubMed [if applicable], Cited X times, and most interestingly to me, Context. Clicking on the Context link produces a popup window featuring the text where the particular reference is being cited. There are many more features of this “article of the future” highlighted in the prototypes. It seems the publishing revolution may well be forging ahead, and if we don’t want to get left behind, we’ll have to plunge in and get up to speed. Personally, I find this exciting, but wonder how long it will take for this model to be fully accepted by the scientific community. And, I confess to a preference for reading in hard copy – it’s far less tiring for my eyes. Kent Anderson on the scholarly kitchen blog (which focuses on scholarly publishing): The “Article of the Future” — Just Lipstick Again?